Spending too many millions of $/£ on iconic collections, hoping to attract more visitors to see them, while neglecting more demotic and contemporary collections. Spending too many millions of £/$ on iconic buildings and exhibitions, hoping to attract more visitors, while neglecting how people engage and make meaning of collections. Establishing and continuing work traditions that bear little connection with the true meaning of stewardship, which is to care for things that don’t belong to you. Paying little attention to the changing and unstable meanings of collections over time (and between different communities). In particular, not recognising that NOW is a time of extraordinary upheaval, requiring a much greater focus on contextualisation and meaning-making. Resisting efforts to increase and measure the social and educational impacts of museum work. Believing that when money directly gained from ecocide or violence is given to a museum, it is washed clean. 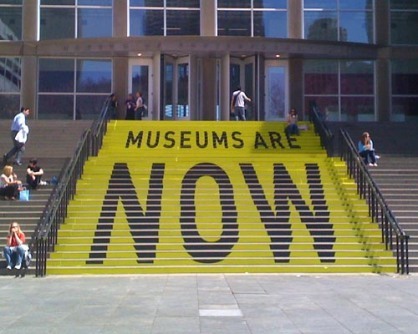 What’s the alternative, or what do I think is next for museums? I think what you’re saying (and if not, it’s what I’m saying!) is that we need a conversation that includes all parties at the table, not just the techies, or the curators, or the environmentalists, or any other subgroup for which – rightfully – their own worries and topics are the most important in the world. I believe we will never become great at anything (audience engagement, outreach, sustainability, expositions, interaction) unless we really start talking. But then again, we all know that. The trick is: how to get the conversation going? Yes, definitely. I agree. I think museums and cultural objects are a great place or focus for conversation about stewardship and recovery. I think that if museums have higher goals than self-preservation (i.e. keeping my job and keeping the museum in credit), they will start to overcome their internal differences, start to be perceived as more relevant and start to develop better techniques for participatory interpretation too. Reblogged this on Koven's (Not Real) Blog.